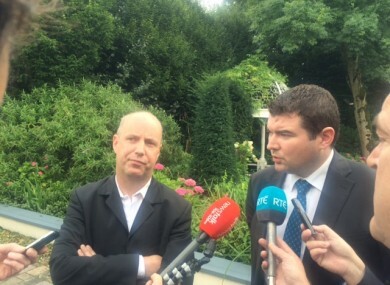 TDs Jim Daly and Brendan Griffin think Enda Kenny needs to outline a timetable for his departure. DESPITE TAOISEACH ENDA Kenny telling the world he has his mojo back, there are rumblings about a change of leadership at this year’s Fine Gael think-in. Two Fine Gael TDs have called on Kenny to outline a timetable for his departure. “A change of leadership is required,” said TD Brendan Griffin, speaking to TheJournal.ie. A time comes when you have to say we have to confront this. It is not a pleasant thing to be questioning anyone’s leadership. The Kerry South TD said members have a duty to protect the party as it is in the “country’s interests” to have a strong Fine Gael. He said other backbenchers in the party hold the same opinion, but he wouldn’t specify the figures. I am not going to put a number on it, but from speaking to members in the party, it is a common feeling – not everyone is prepared to say it publicly, for various reasons. In a political party everyone is entitled to have their own opinion – and that is my opinion. I certainly feel for the country’s sake and for the party’s sake that we need to confront the matter now. Griffin said the instability in government and the possibility of a snap election is a real threat to the party, which could be caught on the back foot. “The key issue here is the lack of election preparedness,” said Griffin. Griffin said the situation in government is “quite volatile”, adding that “one or two people could bring the whole thing down”. TD Jim Daly said he is “not hung up on a date or a time” for a change in leadership – but indicated discussions should take place within the party after October’s Budget. He said he wanted to be very clear that the only reason he is commenting on the leadership of the party is because Enda Kenny has said he will not lead the party into the next election. That leaves us in a situation where there could be an election at any stage. The instability of this government is there for all to see – so I do think it’s urgent. We need to pass the first budget and then between the first budget and the second budget the party needs to have a grown-up conversation about leadership. There is no point in pretending this is going to go away. Daly said that due to the fall in numbers, everyone’s voice counts when it comes to the leadership question. The Cork West TD said the vast majority of the party members agree with him. I don’t think there is any member of the parliamentary party that doesn’t share or agree with what I have said about the Taoiseach setting the timeline himself … I don’t think any member of the parliamentary party would disagree with me that we need to have a conversation about that after the Budget is passed. But what does one of the main contenders for the leadership think – does Simon Coveney think it is time for Kenny to set out a timeline for when he will step down? “The feeling of the vast majority of members of the party is that they respect Enda Kenny’s mandate as Taoiseach and leader of Fine Gael right now. They trust him to use his judgement as to when there should be a leadership change. That’s certainly the position I have and the vast majority of others,” said Coveney. I am not going to put any timescale on it — looking three years ahead looks like a long time at the moment, politically. The focus of the government and the Taoiseach is to bed down this government, get this Budget through and start solving people’s problems. I am happy to let Enda Kenny make a judgement call as to when the right time will be for a leadership change in Fine Gael. Coveney said he believed the vast majority of parliamentary party members “are supportive” of the Taoiseach. During closing remarks to the press at the think-in today, Kenny was asked what message he had for the TDs that were threatening to withdraw support and votes for the Taoiseach if he hadn’t indicated his departure plan by Christmas. I have a mandate from the Oireachtas as Taoiseach, as head of government, in the most challenging times our country has seen in a very long time, not just at home, but abroad… I have no intention of walking away from my mandate. He would not be drawn on whether he would fight a motion of no confidence. Email “'A change of leadership is required': Rumblings in Fine Gael that Enda should go”. Feedback on “'A change of leadership is required': Rumblings in Fine Gael that Enda should go”.